Birthday season just ended around here! October marks the start of birthdays in our family and then we have one each month until March... and then we start the half-birthday celebrating! Each kid in my family is different and so we tackle birthdays a little different for each one. I usually do a few home parties each year and some parties out at a fun location like art places or Chuck E. Cheese's at other more busy times of the year. 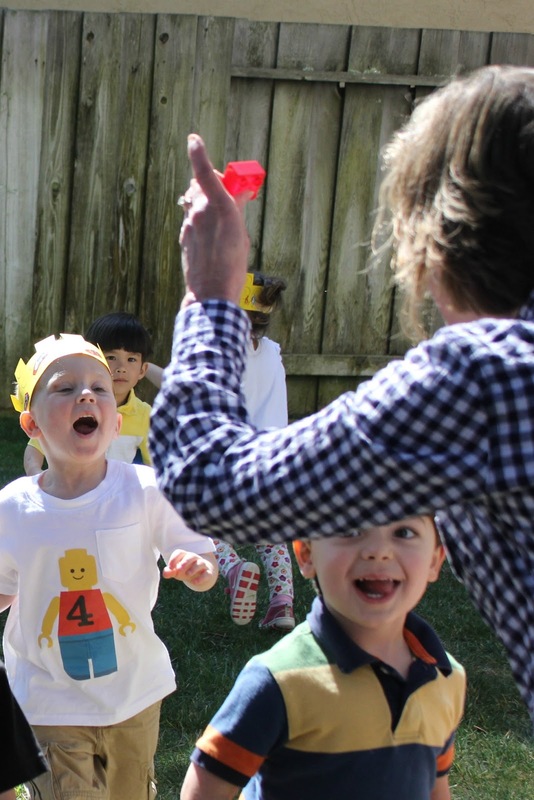 I LOVE when my kids get into a LEGO brick phase because I think LEGO brick themed birthday parties are the best! I previously shared my favorite LEGO brick themed party food with you. There are a lot of great resources on the internet (I have several pinned on my LEGO pinterest board), but today I have gathered a few of my favorite LEGO themed party games that aren't too hard and that are tried and true winners (at least at our house) to share with you. 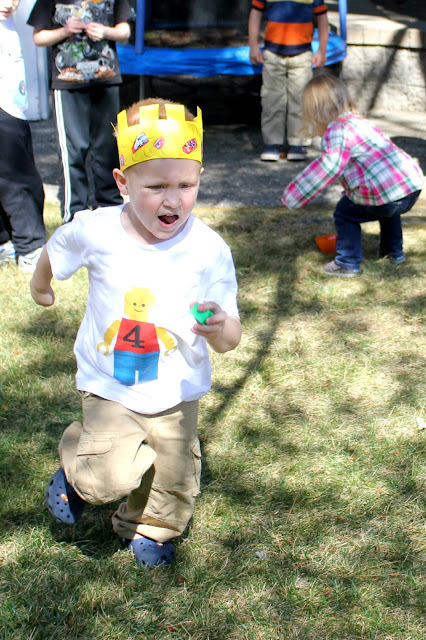 If you have additional favorite activities for a LEGO brick themed party, please share them with me! These activities are for older three year olds on up. 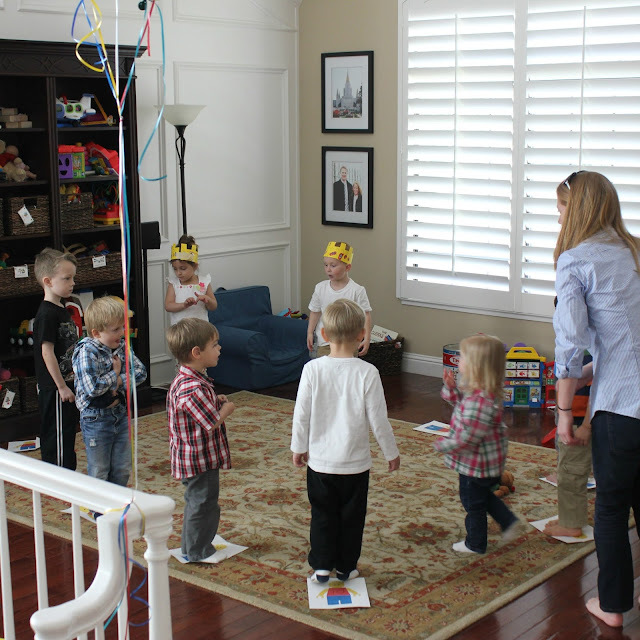 I typically do open ended activities and skip the organized games for the two and young three-year-olds. 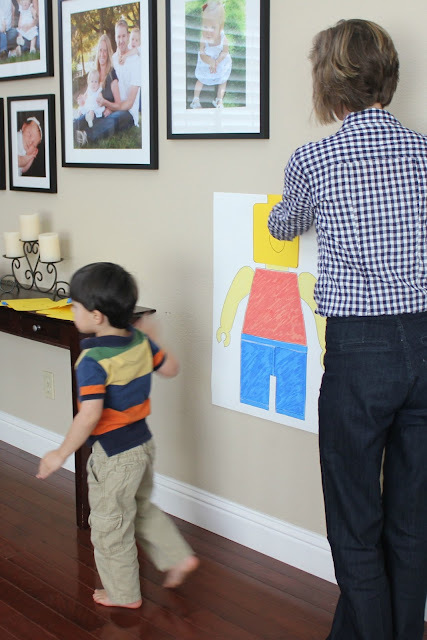 Lego brick sensory bins and simple LEGO brick art activities work great for the younger toddler crowd. This activity is super easy! You just need one red lego and one green lego (preferably some big ones) and then you need to get your party people to line up! Have them line up with their backs to a wall or fence. We prefer to do this activity outside. You hold the red lego up in the air when you want them to stop and the green lego up in the air when you want them to start walking/stepping (pretending they are moving like LEGO men!). This is totally a LEGO twist on Red Light Green Light and kids love it! You can do all sorts of LEGO relays using LEGO bricks. One easy one is to put 2 giant buckets of LEGO bricks on one side of the yard and 2 empty buckets on the other side of the lawn. Have the kids work together in 2 teams to move the bricks from the full bucket and fill up the empty bucket. Another favorite is putting the LEGO brick or mini-figure on a spoon and working in two teams, taking turns, to bring all of the LEGO pieces across from one side of the yard to the other. There are so many fun relays you can try! Kids could also have a race to build a certain LEGO figure/creation. For this one I just cut out LEGO heads, attached tape to them, and made a body on poster board and the kids put a blindfold on and tried to see if they could stick a head on the LEGO man. It is always so funny where they end up! This activity was super easy! 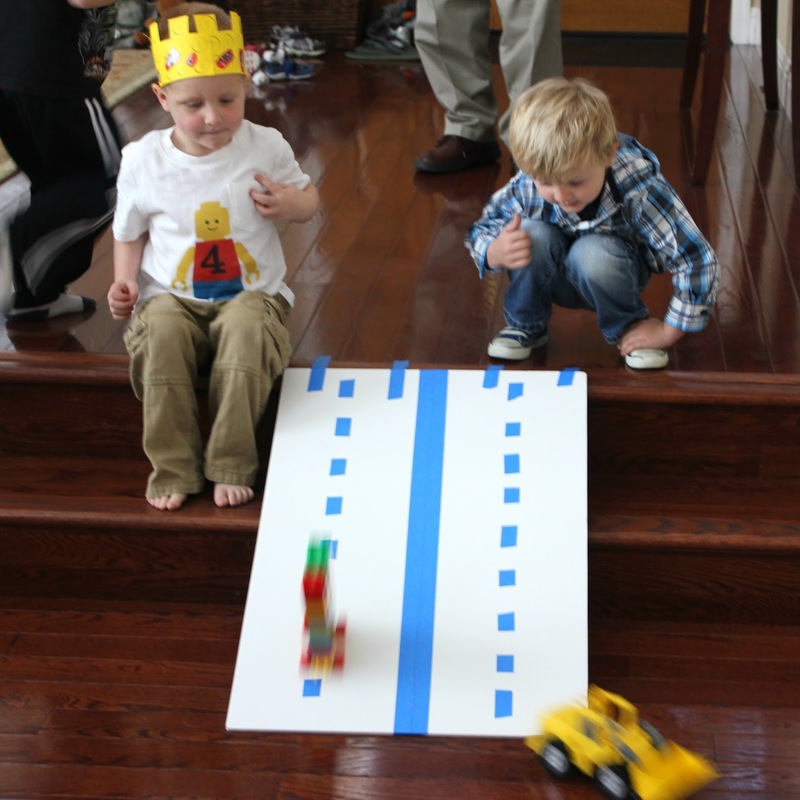 The kids just made their own cars using LEGO bricks and wheels or they used some of our favorite LEGO trucks and toys. Once their car was built they got to race it down a foam board ramp. I used a little painters tape to make the racetrack look like a road way. Grab some bubble wrap and cut it into rectangles. Then cut some large colored easel paper into rectangles that are the same size. Tape the colored rectangles onto the floor and add the bubble wrap sheets taped to the top. Kids can jump around the room and try and "pop" the giant bubble wrap LEGO bricks. This activity is so easy! 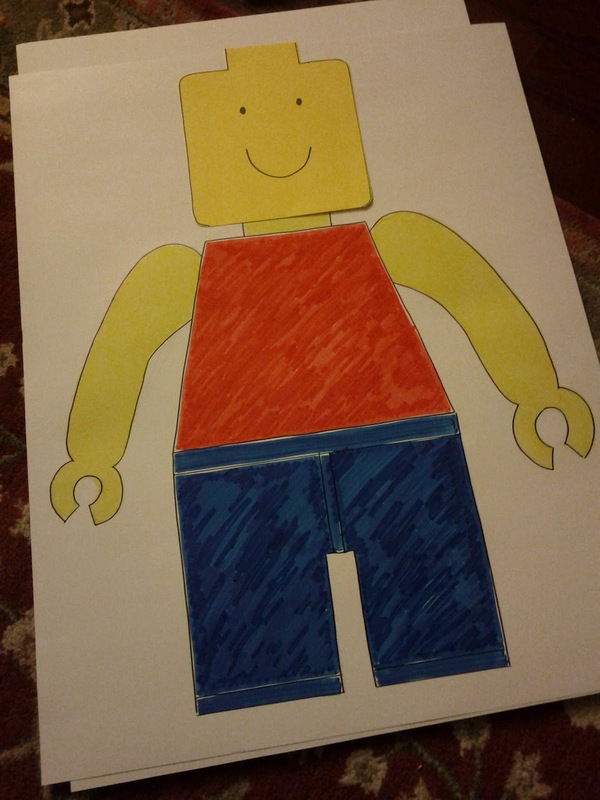 Just print out a bunch of LEGO mini-figure men pages or draw your own. Then write numbers on the LEGO men. Turn on some music and have the kids walk around the circle. Stop the music from time to time and call out a number. The child that is standing on that number gets a piece of candy! Repeat. This is alway one of our favorite games. Grab a water gun or Nerf gun and some LEGO mini-figures or even LEGO bricks. Line up the toys standing up and knock them down with the water gun (or nerf darts). This one is fun to play again and again. 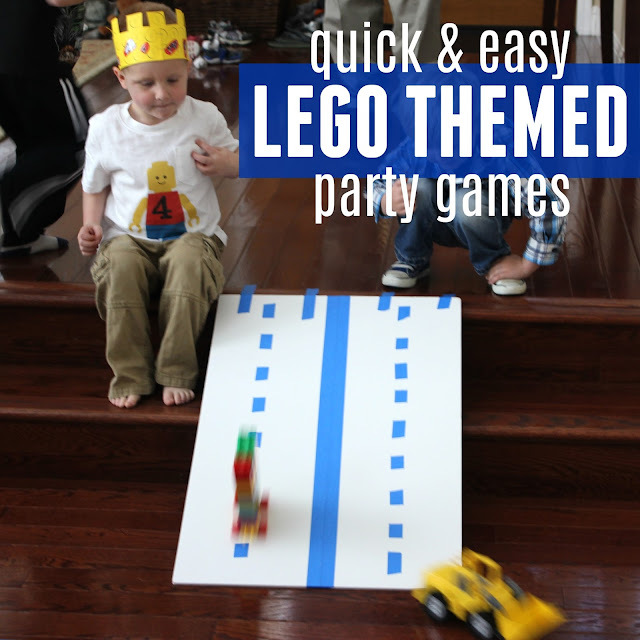 If you have any other easy peasy LEGO brick themed party games, pass them along! We'd love to add them to our list!